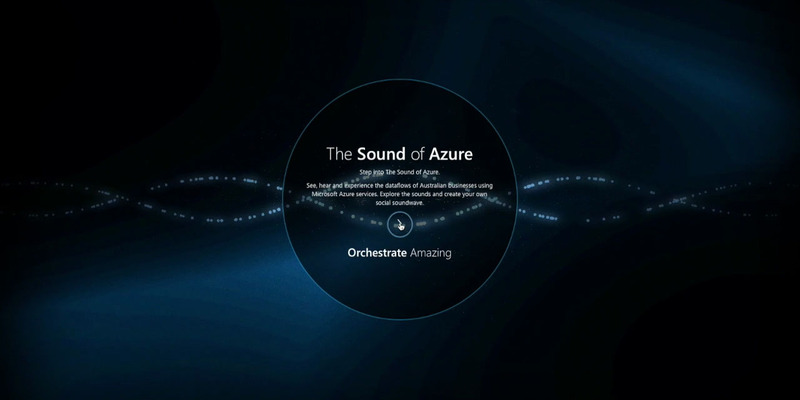 Microsoft approached our friends at Current Circus to create a website that featured procedural graphics and sound generated from live Azure Cloud data. This website would coincide with the launch of Azure in Australia. In turn, we delivered the realtime graphical component of this project. Each helix in the visual represents a company using Azure Cloud Services. The user can rotate around and interact with each company - clicking on one reveals 4 DNA strands: Compute, Websites, Storage, and Database. The expansion of the DNA initiates a procedurally generated audio sequence, an interpretation of Live Azure data. At launch, WebGL hadn't yet been fully adopted by all browsers, and yet WebGL was really the only technology that could fully realise the creative direction of Wunderman. The visuals respond to sound at quite a low level, using both frequency and volume. Ideas of responding to higher level (structural elements) were thwarted due to high latency in available sound libraries.